LG Display has recently announced a prototype solar-powered e-book reader, designed to compete in the growing market of gadgets that offer digital access to textual content. This innovative device converts sunlight into electric power, thus providing readers the ability to read books, magazines, or personal documents even when the battery has ran out. Though only in its preliminary stage, it has focused the attention of the industry’s leading manufacturers. The new e-book reader has a 15.24 cm display panel and a 10 cm square solar panel; impressively, the solar cell measures just 0.7mm in thickness, thus obtaining the relatively light weight of 20 grams. Since portability is an important aspect of e-readers, it gives LG an edge over its competitors; though no total weight was announced, the light solar panel will surely help make it a lightweight gadget. The installed solar cell is created by using a glass or plastic substrate rather than using the more conventional (and troublesome) crystalline solar cells that require silicon wafers. According to its maker, the current energy conversion efficiency of the solar cell is a mere 9.6%, but plans are to increase it to 14%. Exposing the solar cell to sunlight for about 4 to 5 hours extends the battery running time by up to a day, without the need for additional charging. While indoor users might complain that they suffer from lack of sunlight, they are also more likely to have AC outlets nearby. Currently LG plans to have the solar e-book reader manufactured commercially only in 2012; therefore, no price has been announced. TFOT has covered other e-book readers, such as two of Amazon’s products: the Kindle 2, slimmer and more compact design than its predecessor, and the Kindle DX, which is has a larger display. Other related TFOT stories include a piece about the Cybook Gen3 e-Book, which boasts an extremely fast page-flip speed, and Plastic Logic’s technology, which copies the appearance, but not the feel, of a printed newspaper. 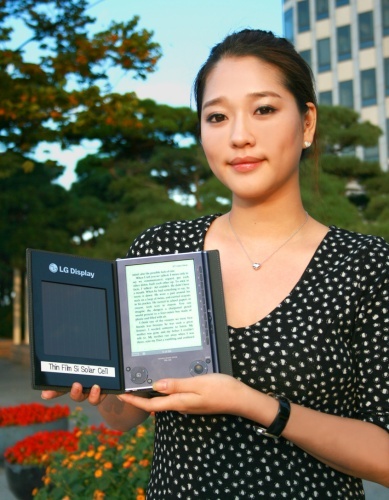 For more information about LG’s solar e-book reader, see their press release.